Thursday, October 20, 2016 at 12:30 p.m.
Join us for our October Third Thursday demo when Karen will show you how to use Electric Quilt to design your own quilts. The software is easy to use once you know a few tricks, and it’s available for PCs and Macs. You’ll learn how to scan and import fabric swatches and then design a quilt that’s the size you need to use up what you have in your stash. We’ll have the big screen TV out for the demo. If you already have EQ7 bring your laptop and follow along. Otherwise, watch and find out what this powerful tool will do for your creativity. NOTE: There will be NO demo on Saturday, 10/22, as previously planned. How does winning TEN YARDS of fabric sound? How about having fun with other quilters at the same time? Join us on Tuesday, October 25 when we'll open the shop doors at precisely 6:15 p.m. You'll then have exactly 20 minutes to choose 3-5 bolts of fabric to make your dream quilt. One lucky winner will take home ten yards of fabric from the bolts they selected. 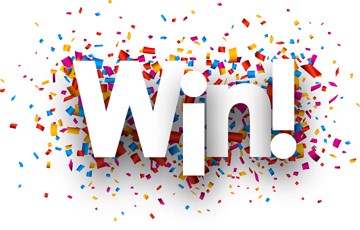 We're not revealing how the winner will be chosen until the event, but we will say it won't be by random drawing. We'll also have a couple of specials running during this event, and we'll give a way a few door prizes to add to the excitement. Intrigued? Call 970-565-7541 to RSVP. This event is limited to the first 20 people who sign up, so don't delay! Adults only please. Must be 21 to win. Many thanks to Judith Swain for coming up with this great idea. 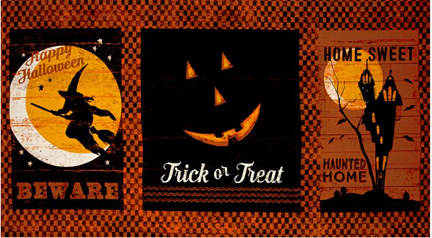 You still have plenty of time to make trick-or-treat bags, pillowcases, table runners, and more. Scoop up what remains of our Halloween collection at 30% off. If you're participating in the Halloween Challenge (entries due October 27) pick up backing for your project. Hurry in! This handy organizer features inner zippered pockets made from mesh and vinyl for easy visibility. Small enough to fit into a glove box, the small version is perfect for a first-aid or travel sewing kit. 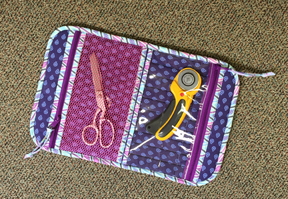 The larger case will hold documents, maps, journals, sewing notions, jewelry, and more. The sew-in magnetic closure keeps your belongings secure. Judy Bryan will teach this class. 1:00 p.m. – 5 p.m.
Back by popular demand . 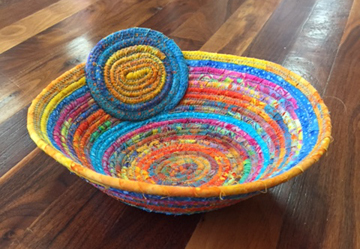 . . Aimee King will teach Wrapped Baskets in this new scaled back half-day class. You’ll still learn everything you need to know to make these beautiful baskets, just over a shorter period of time. Sign up today. These classes almost always fill up quickly. 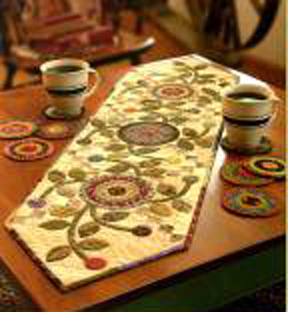 Guest teacher Sine Skaggs has been using a special technique to make this charming table runner from a Kim Diehl book. Join us on Saturday, October 29 for class (and for two hours on Saturday October 22 for prep and homework) and have this ready for your Thanksgiving table. 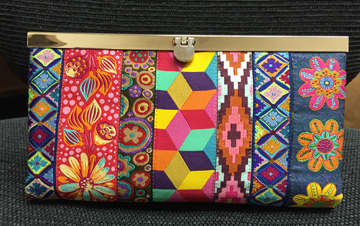 As long as we keep getting requests we’ll keep teaching the ever-popular Diva Wallet. For this class, you can choose to make it with ribbon on the outside or with fabric. Judy Bryan will teach. 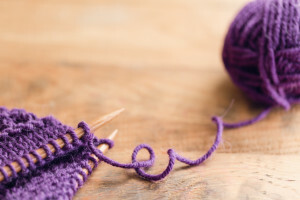 Using larger needles and yarn making your first sock as a Christmas Stocking will be a breeze. 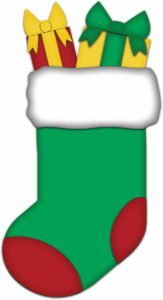 Your stocking can be any size and one, two, or as many colors as you’d like. Class #1: Cast on and knit the leg; Class #2: Knit heel flap; Class #3: Decrease toe and finish sock. 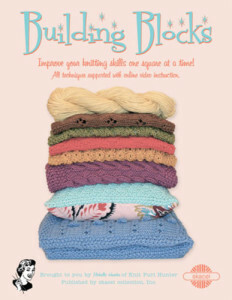 This class is for intermediate knitters (i.e., you must know how to cast on, knit, purl, decrease, and increase). Anne Worthington will teach this class. Click here to see all upcoming yarn shop classes.